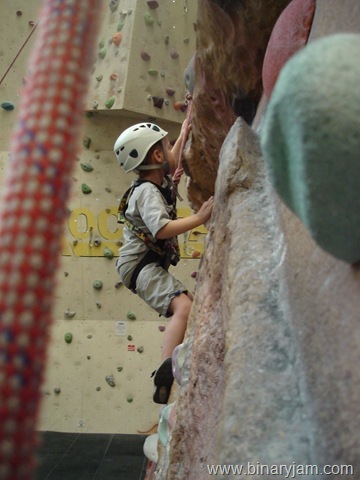 On Saturday I took J for his first indoor climbing session and proper climb. We had done a little bouldering with me holding the scruff of his t-shirts and stopping him before he got out of manageable handling. But this time it was for real, ropes and harnesses. We went to a place in Birmingham called Creation indoor climbing. This is not a bad little place, actually its reasonably large and for those who remember “the Rock Face” (probably one of the best ever climbing walls with a huge 75 ft overhanging lead (23 metres)) it has the old bendcrete wall covering large portions of the site. It’s bouldering is a little shabby which probably comes from the large surface area the not particularly thick landing mats cover. The climbs are well labeled in the french grading system, something that I’m getting used to now, makes more sense for indoor routes. Back to J, he had a great time, whilst I don’t think I have a budding Ben Moon on my hands, yet anyway, he had a good attempt at climbing. For a child he has an over developed sense of danger and was concerned he would hurt himself, something he didn’t have climbing outdoors when he tried to climb higher than I would let him. One of the problems with teaching a five year old is that you cant teach them to just jump off and feel the rope catch them, if they don’t feel comfortable, and what first timer does, they just won’t do it. An adult you can say just jump off I’ll catch you and they do, whether you catch them well ….. of course you do and they learn with each fall to trust the belayer. I’m hoping to take him again this weekend if I get time. Some of the best news in a long time for climbers is that another wall is opening in Birmingham. The people behind it I have considerable faith and trust in, all committed and experienced climbers. For those who remember the Rock Face, “Phil” is project manager. The new wall is called RedPoint and opens sometime in September. With the list of facilities and people involved I have really good feelings about this place, and its easier to get to than Mos Eisley (Mosely, Birmingham).